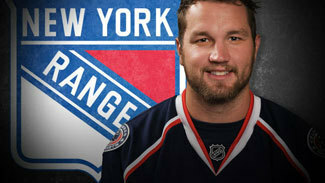 Rick Nash is bound for Broadway. After spending his entire NHL career with the Columbus Blue Jackets, the most successful player in franchise history was traded to the New York Rangers on Monday for three players and a first-round draft pick. Nash heads for the Big Apple holding most of the Jackets' franchise scoring records, but with only one playoff appearance to show for it. 0 -- Playoff games won by the Blue Jackets during Nash's time in Columbus. The Jackets were swept by Detroit in 2009, the only time the franchise has made the postseason. 1 -- Major awards earned by Nash. He scored 41 goals in 2003-04, his second NHL season, to earn a share of the Rocket Richard Trophy, given each season to the player with the most goals. Nash is the youngest player to win the award. 2 -- 40-goal seasons for Nash during his nine years in Columbus. In addition to his 41 goals in 2003-04, Nash scored 40 goals in 2008-09, when he also put up a career-best 79 points. 3 -- Career playoff points for Nash, who had a goal and two assists in four games in 2009. 4 -- Seasons in which Nash had 60 or more points. Beginning in 2007-08, he had 69, 79, 67 and 66 points for the Blue Jackets before dropping to 59 in 2011-12. 5 -- Consecutive 30-goal seasons by Nash, who scored at least 30 times in each of his final five seasons with the Jackets. It's the fourth-longest streak among active players. He reached the 30-goal mark last season by scoring in Columbus' final game against the New York Islanders. 6 -- Longest consecutive-game goal-scoring streak for Nash. He's done it twice, most recently when he had goals in six straight games in November 2010. 7 -- Most game-winning goals by Nash in a single season. He had seven winning goals in 2003-04 and matched that total in 2010-11. In all, he has 44 game-winners in nine seasons. 8 -- Goals scored by Nash in his nine career games against the Rangers, including one in the teams' only meeting last season. 9 -- Most penalty minutes in a game by Nash. He's had that many only twice, most recently against Anaheim on April 7, 2007. 10 -- Most shots Nash has taken in a single game. He did it three times with Columbus, most recently on Jan. 17, 2008, at Phoenix. His 10th and final shot was a highlight-reel goal with 21.5 seconds left that gave the Blue Jackets a 4-3 victory. 11 -- Nash's plus-minus rating in 2008-09, the best during his nine seasons in Columbus. He was minus-71 overall during his time with the Blue Jackets, but that includes a minus-62 rating in his first two NHL seasons. 14 -- Shorthanded goals for Nash, all of which have come in the past six seasons. His best single-season total was five in 2008-09; he had two last season. 24 -- Goals for Nash against Detroit and Chicago, the most he's had against any team. He's scored 20 against St. Louis and Nashville, the other two teams in the Central Division. 39 -- Assists by Nash in 2008-09, the most he's had in a single season. He's been credited with 30 or more assists just five times in his nine NHL seasons.